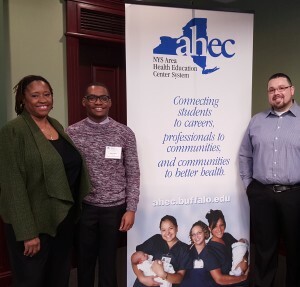 Albany, NY (February 4, 2016) — Second year Mid-Hudson family medicine resident Andres Gonzalez, MD, addressed the NYS Area Health Education Center (AHEC) System Legislative breakfast. He spoke about the importance of programs like AHEC and the Teaching Health Center program that provide health professional students and residents with opportunities to work in rural, underserved communities. Dr. Gonzalez is training in Ellenville, NY, and shared how surprised he was to find that more than half of his patients in this small rural community speak Spanish. He said “being a doctor at the Ellenville Family Health Center is a dream come true,” harking back to his childhood going to a small rural ambulatory clinic outside of Sacramento, CA that shaped his desire to become a doctor.